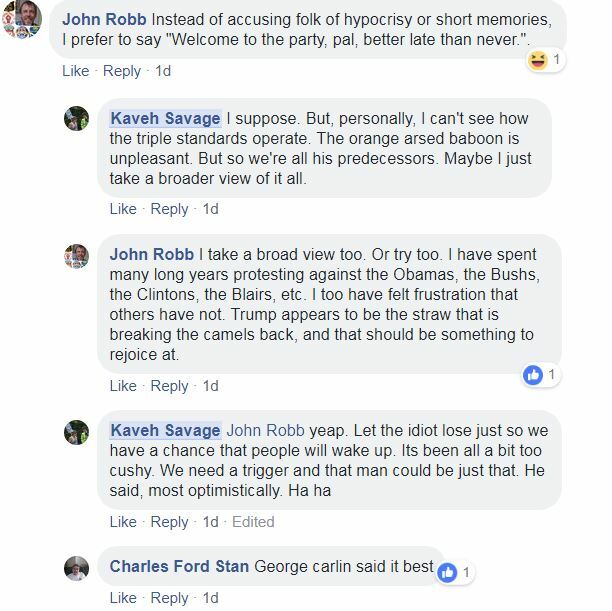 In that last comment I assume of course that Kaveh Savage’s “let the idiot lose” is either a typo or common spelling error; that he means “let the idiot loose”. It’s an extreme argument with obvious dangers when generalised, as when Germany’s left took the disastrously sectarian decision to draw no distinction between workaday capitalism and the nazis.2 But Trump, for all the hot air to the contrary, is not a fascist and has no such support base. We are living in an extreme world – witness the threats to our natural environment, string of wars on the middle east and alarming baiting of nuclear Russia (rising tensions, too, with China) and staggeringly dysfunctional levels of global inequality – a fact reflected by Trump’s victory over a crooked Democrat machine and large sections of America’s ruling class. Yes, reflected. Not caused by. And that’s the point. Since Trump is reflection rather than cause, his buffoonery does create opportunities for deepening our critique of a morally indefensible and practically unsustainable economic system. On this occasion I deduct ten percent from Galloway’s score for sectarianism. (In other contexts I’d deduct far more, but here share some of his frustration.) Three questions. One, is Trump an awful human being? Unquestionably. 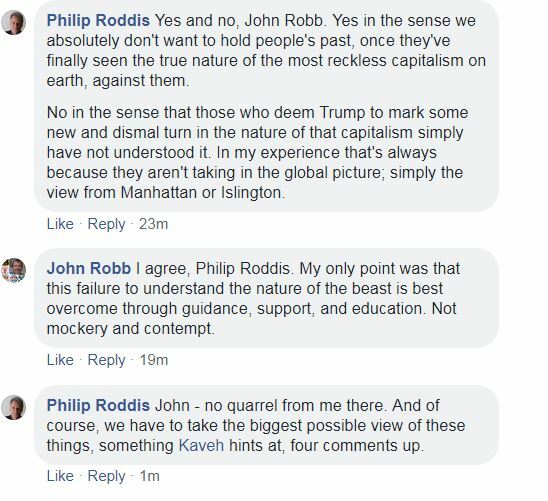 Two, do his detractors show deep ignorance of America’s (and capitalism’s) bloody record, especially in the global south? Same answer. Three, should we mock and vilify said detractors for that depth of ignorance? Bad response. We should express our agreement with them on point one, while (respectfully) engaging them on point two. That said, my experience – over two years of frequent engagements on the Trump/HRC issue – is of my own courtesy in debate not being reciprocated by those insisting, in righteous fury, that only a madman could fail to see HRC as ‘lesser evil’ or Obama as a ‘great president’. It is, Rich. You’ll recall that we met on FB precisely because a man calling himself a christian socialist had assumed in both our cases that opposing HRC equated to supporting DRT. Of course, many have made and continue to make that simplistic equation, but this ‘christian socialist’ sprayed extreme – though not unique – venom. The likes of you and me were, in his words, ‘human excrement’.